1. 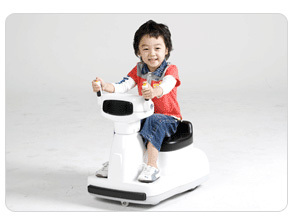 RING8O is a riding toy that easily moves forwards or backward and enables the driver to control directions such as left and right, usng the rotation of a joystick rather than a steering wheel. 2. 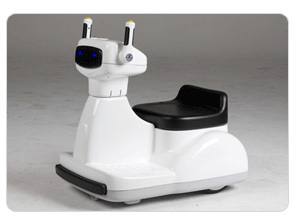 RINGBO is the worlds first intelligent riding robot manufactured using stateof-the-t robot technology. It has the following features: obstacle reco?ion through a sensor, status notification, and English conversation. 3. This ring toy can freel move about indoors since it does not require a rotation raus it uses patented technology for individual left and right turn operation.